The Retrak Utopia 360 VR brings the world of virtual reality to you via your smartphone and at a fraction of the price of its competitors. It also includes many of the same exciting features that virtual reality gamers have come to love on the more expensive VR headsets. This includes a full 360 experience and incredible visuals, and often invokes the same response in each Retrak Utopia 360 VR review. Furthermore, it has a list of free apps, which include roller coaster themes, racing themes, jet themes, and underwater themes, as well as a Bluetooth controller for the ultimate gaming experience. And, it is also available in a two pack, so you can share the experience with a friend. For more information on the features, the design, and other details of the Retrak Utopia 360 VR, simply check out the following Retrak Utopia 360 VR review. Available in a two pack, so you can share the experience. Apps may take a while to download. 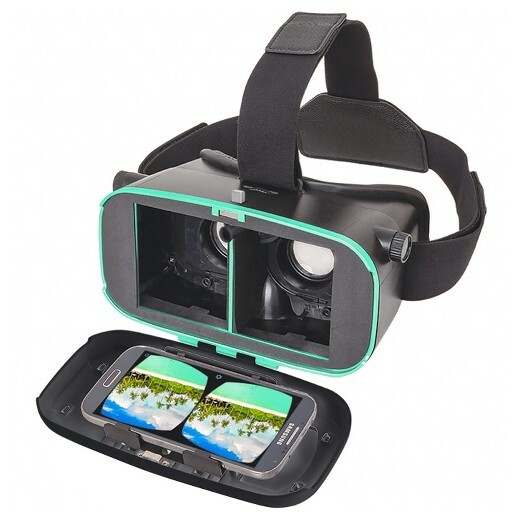 The Retrak Utopia 360 VR features a 5-3/4″L x 7-3/4″W x 3-3/4″H ventilated black plastic headset with memory-foam cushion, which provides a fit so comfortable that it feels custom made. It also includes a comfortable head strap and a patented LucidView lens, which provides an anti-glare view for less eyestrain while you play, in addition to dual adjustable focus with retractable focal length and interpupillary distance. And since it’s portable, you can take it with you wherever you go with comfort and ease. The headset is compatible with just about all standard-sized smartphones and iPod Touch, and it requires no batteries. The smartphone itself fits into a handy flip case located on the front of the device, which also includes a sliding cover that opens to reveal your smartphone’s camera, which can then be used to explore augmented reality apps for added enjoyment of your device. When the augmented reality feature is in use, the device uses algorithms and sensors to determine the alignment of the camera. Augmented reality technology then provides the computer-generated graphics as they would appear from the camera’s angle, superimposing the 3D images over the user’s view of the real world. The Retrak Utopia 360 VR is compatible with many free apps from the Apple Store and the Google Play Store, and it also has a built-in active button with capacitive touch technology for maximum app compatibility. The Retrak Utopia 360 VR offers some of the best-simulated visuals for its price. In fact, according to one Retrak Utopia 360 VR review, the visuals are so clear and impressive that it’s scary. It also provides seamless 360-degree vision, so whether you look down, up, or all around, you are immersed in the action. Simply insert your smartphone, along with the chosen app, into the designated pocket located on the front of the device, and then sit back, relax, and enjoy hours of virtual reality entertainment. The Retrak Utopia 360 VR can be used to play virtual reality games or to watch virtual reality videos. The audio on the Retrak Utopia 360 VR provides quality sound that perfectly complements the simulated video. However, according to one Retrak Utopia 360 VR review, the sound is even more pronounced when it is heard through a headphone, and it is loud enough to drown out background noise. Additionally, the device picks up even the smallest of sounds, such as creaks, squeaks, and cracks, for a real, true-to-life experience. Some Retrak Utopia 360 VR models also include a compact handheld Bluetooth compatible joystick for use with certain games, which is indicated on the list of available apps included in the package. 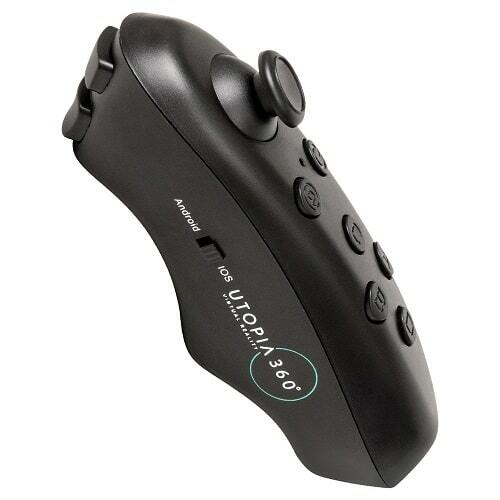 The controller requires two AAA batteries, which are not included, and includes a total of eight buttons, including a power button, a game mode button, and 4 action buttons, for more control over your game. It also includes an Android and an iOS switch, which can be used to set the controller for your specific device. Some Retrak Utopia 360 VR models also include Bluetooth earbuds, which offers superior sound quality, and they also cancel out background noise. And since they contain no wires, they also allow users to enjoy a hassle-free immersion virtual reality experience. Overall, the Retrak Utopia 360 VR promises a great virtual reality experience with a comfort-fit headset, great visuals, and crisp audio all at an affordable price. It is also both easy to use and set up, which makes it a great choice for first-timers looking to explore the world of virtual reality via a headset. 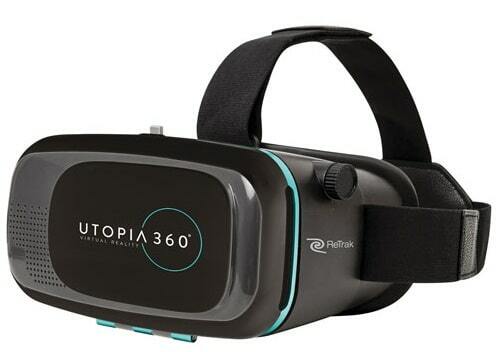 Furthermore, each Retrak Utopia 360 VR review from customers expressed such awe with the Retrak Utopia 360 VR, some of who were even more experienced VR gamers, so you know you won’t be disappointed. Also, with tons of free games available via the Apple Store and the Google Play Store, it’s enough to keep both novice and experienced players intrigued for hours.